Where do the Amish live? Places like Ohio, Pennsylvania, Wisconsin, and Indiana probably come right to mind. But they’ve also lived in some rather unusual locations. 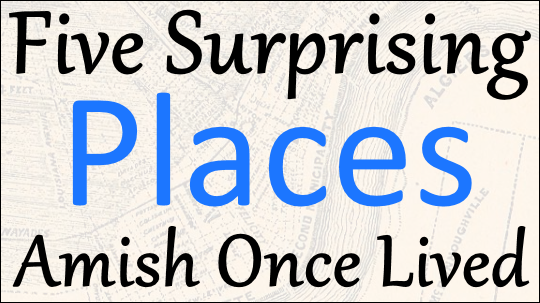 Here are some of the more suprising places Amish once called home. Primary sources include David Luthy’s The Amish in America: Settlements that Failed 1840-1960, and Steven M. Nolt’s A History of the Amish. How did Amish find themselves south of the border? A combination of school troubles in Ohio, plus an attractive–at least at a distance–land opportunity led to this most unusual community. 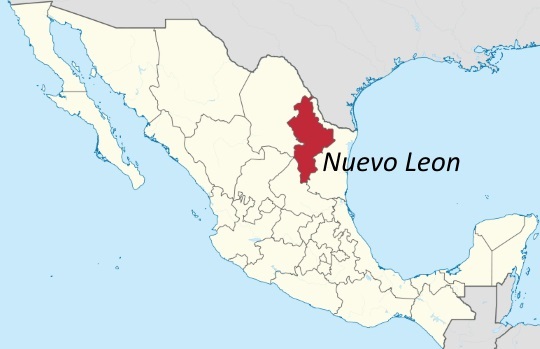 In 1923 a “vast ranch” called Hacienda El Prado went up for sale in Nuevo Leon state in northeastern Mexico. A San Antonio land agent gave it the more English-friendly name of “Paradise Valley” and advertised the tract via promotional pamphlets. At the time, Amish in Wayne County, Ohio had been having problems with state school requirements. In 1922 five Amishmen were arrested for violating regulations, including not permitting their children to study the subjects of History, Geography, and Hygiene. A week following their arrests, nine children were taken into state custody. They were placed in a home and dressed “in town clothing”, with boys’ hair cut and girls’ hair braided in pig tails. Over two weeks passed before their parents could secure their release. In this context, a new location–even outside America–without strict educational requirements sounded appealing, as did the cheap land and spring-like climate apparently available in Paradise Valley. After determining that ministers would also move (very important), and that a bishop would travel for baptisms, marriages, and to hold communion, the decision was taken to found a community south of the border. In December 1923, a total of eight households made the move to Paradise Valley. The land turned out to be a “barren prairie”, though the soil was very fertile if irrigated. Amish sold their crops in the city of Saltillo, and built with adobe blocks. As for education, David Luthy writes that “the settlers saw little need in sending their children to school.” One resident later commented that he attended “only around two weeks” of school over six years. A couple of disappointments made life in the community more difficult. A promised railroad never materialized. And the community also lacked a minister. Four years after founding, one finally came to visit–preaching the only Amish sermon in the history of the settlement. But what likely led to this settlement’s end was the ongoing revolution in Mexico. Soldiers on both sides took food, and “borrowed” horses which never returned. One Amish youth was even taken prisoner by rebels for a brief time. The Amish had all left by 1929, with ministers in Ohio having “formed the opinion that it was not God’s will for anyone to move to Mexico” (for more on this community, see Luthy, Settlements that Failed, p. 512-521). In the 1700s, a number of Amish families traveled west across the ocean to reach freedom in Pennsylvania. Others looked east within the European continent. 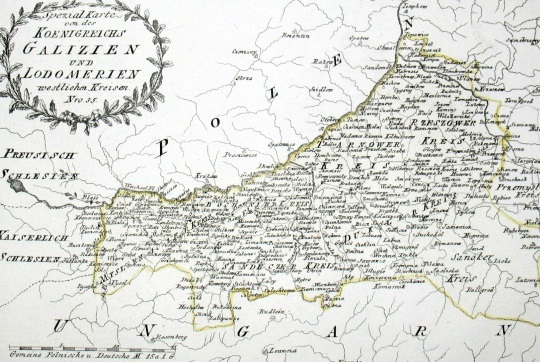 In 1781, the Austrian emperor invited German farmers to move to Galicia, a region which today lies in southeastern Poland. Around 20 Amish families were a part of the over 3,000 German households who took the emperor up on his offer. These Amish came from Alsace, Montbéliard, and the Palatinate, and were joined by a number of Mennonites. The Amish were led by a former Catholic convert to Anabaptism named Joseph Mündlein. A little over ten years later, some of these Amish went further east and joined a group of Hutterites, to form a mixed community which only lasted around one year. Interestingly, Steven Nolt writes that “perhaps the Amish were not prepared for the sort of strenuous Hutterite work ethic. In any case, the Amish claimed the Hutterites were interested only in material profit and left in disgust,” with two young Amish women staying behind to marry Hutterite men. These Amish eventually ended up in Russian Volhynia (today northwestern Ukraine), where they were joined by nearly all of the Galician Amish. In addition to the Amish settlers in Galicia, some others settled the area of Wlodawa–today a Polish border town, but then part of Lithuania (see Nolt, A History of the Amish, p. 64-65). The abundance of timber is what drew lumberman Jonas Hochstetler to move his family to British Columbia in 1969. Perhaps the province’s natural beauty with its many mountains and lakes also played a part in the decision to uproot and move to the other side of the continent. 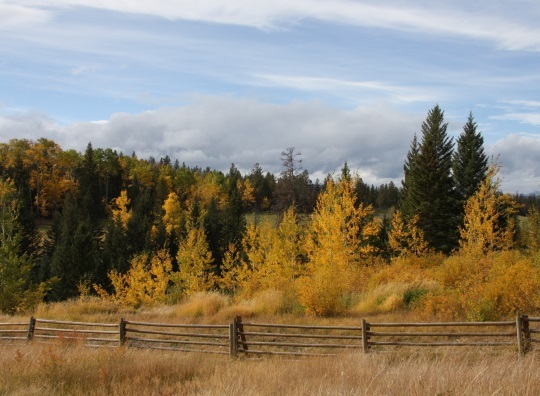 The Hochstetlers were part of a small group of settlers hailing from Ohio and Indiana who migrated to Horsefly in the Cariboo region of the province. But being over 2,000 miles from their home communities, its remote nature ensured the settlement would be short-lived. The community lasted but a few years, with only a handful of Amish ever living at Horsefly. The final family, Jonas’ son Martin, departed for Ohio with his wife Susan and their young son in 1972. About their experience, they wrote that “we missed the brotherhood. We wanted our son to be able to play among other Amish children. We wanted him to go to an Amish parochial school when he grew older.” The couple detailed their time in Horsefly in a book called Life On the Edge Of the Wilderness. Distance from other settlements works against attracting the fresh residents needed to sustain and grow a community. Likewise, David Luthy describes Horsefly as an “Unrealistic Location” in his addendum to Settlements That Failed (see Why Some Amish Communities Fail: Extinct Settlements, 1961-2007, p. 8-10). Horsefly was perhaps the most remote settlement ever founded by Amish on the North American continent. Fernheim Colony, located in the Chaco region of northern Paraguay, was founded in 1930 and still exists today as a Mennonite settlement of several thousand people. Yet Amish once also lived there, for about a decade (1967-1978). Ontario bishop Noah J. Coblentz twice traveled by ship to assist in organizing the church and ordaining ministry. Iowa families were also among the settlers (this 1974 Des Moines Register article describes the experience of families from the Buchanan County and Kalona settlements). In his settlement guide appearing in the December 1974 issue of Family Life, David Luthy describes this community (also referred to as “Asuncion”) as both the southernmost and easternmost Amish settlement at the time. Nolt also shares the thoughts of one participant in the Latin American settlements (Amish also settled in Honduras around the same time) that “‘our way of life’ actually was better suited for an agrarian Latin American context ‘than a rich and mechanized country such as Canada or the United States,’ and that ‘our churches should thrive better spiritually’ among the poor” (see Nolt, A History of the Amish p. 312-314 for more on Paraguay and Honduras). Despite this sentiment, no Old Order Amish live outside the US and Canada today. How did Amish find themselves in the city of New Orleans? Though it wasn’t then like the modern-day metropolis, it was definitely a sizeable city by the 1840s, as you can see by the 1845 map below. In fact, in 1840, the city had a population of around 100,000. This is the time when a small group of Amish apparently lived there. Amish traveling to central Illinois in the “second wave” of immigration in the mid-1800s would enter via the port of New Orleans, then take a steamboat up the Mississippi, and then Illinois River. Sometime Amish became stranded, however, not having enough money to pay for passage to the Midwest. Amishman Christian Oswald is said to have lived here seven or eight years, with his wife baking and selling fancy cakes. Eventually the Oswalds gathered the funds to continue on to central Illinois. An Amish bishop named Peter Nafziger apparently walked from Ohio to New Orleans–on two occasions–to provide ministry to the community. A visitor wrote a letter to a Mennonite periodical in 1871 describing a trip to the Amish in the city. Luthy writes that “they undoubtedly by that time had lost many of their traditions by exposure to urban life.” (see Settlements That Failed, p. 166 for more). W. Dale Kramer wrote a series on the Paradise Valley settlement called The Daughters of Caleb. He credits the book you mentioned. I highly recommend this series. It has enough grit for a man, but boy, does this guy know how to write a love story. This community seems like a great setting for a book. Must have taken some courage and adventurous spirit to go so far from home. I wonder if there wasn’t a little bit of that desire for adventure in the decision to go so far from home to ostensibly solve the schooling problem. I read that series, too. It was very interesting, though I like my stories a bit less stressful. Some good history, right there. I thought you didn’t care for history, Erik! Fascinating information! For some reason, I received notice by e-mail today about the post you wrote yesterday, a day late. Maybe tomorrow I will receive notice about this post! I don’t mind it, when it’s interesting 🙂 Actually, I do enjoy history quite a bit, it just takes more focus to stay on top of the details since it’s more abstract than say writing about communities I’ve actually visited. Interesting about the email coming late, I actually switched the delivery time to an hour later than normal (8 AM) and the system said it went out. Hello, Erik, I received email notification today, May 9, at 7:09 AM that you posted this yesterday! Sorry to accuse you of not liking history. I take that back. You did a swell job on this post. No worries at all, I probably said something along those lines once. And hopefully you got the email at around 6am today (usually they are sent at 6 or 7am). Yes, today I received the email notification right on time. Thank you. Some years back I purchased the book The Amish In America: Settlements That Failed, 1840-1960 by David Luthy. It is most interesting; I would recommend it to anyone who enjoys reading about the history of Amish settlements. It’s a very large book; very informative. I did not know however about the addendum 1961-2007. Very interesting article today. Great book. The addendum is nothing like the original, it is pamphlet sized and has the stories of I believe only 9 settlements, along with a listing of the others, but worth having if you like the original book. You can probably order from Raber’s bookstore. Thanks, Erik for the update on these “lost” Amish communities. It is helpful to those of us today who are looking for another place to live, to learn from past experiences that failed, so we perhaps do not commit the same errors. Yet I believe a “Christian” community can exist by its lonesome self in a remote and undelveloped area of the world. Any bother can become a preacher, simply by standing up and preaching! The calling is from God by the power of the Holy Spirit, not of man, unless one is trying to propogate a sect of man’s creation. There is a new settlement of Horning Mennonites in southern Virginia. At last report, there were five families, all from Pennsylvania. Having no minister among them, they listen to sermons remotely (by phone) from Pennsylvania!!! I could editorialize about this, but choose to refrain! I am a Conservative Friend (traditionalist Quaker). In theory, among Conservative Friends whoever is called by the Holy Spirit is authorized to preach. I can testify that some who rise to the task (unbidden, I believe) are bothers, rather than brothers. Hahahaha!!! I loved your last thought. I just left a store where a clerk thanked me for making him laugh and now I can say the same thing to you. Thanks for the chuckle. Actually, I meant where have the Horning Mennonites settled in Southern Virginia? I wasn’t very clear on that…. I believe that the new Horning Mennonite settlement in Virginia is in the vicinity of Charlotte Court House, Charlotte County, VA. My latest information about them is dated. I have Horning friends who visited there a couple of years ago. I’ll ask for more information when I get a chance. Glad you liked it Leon. There are some fascinating stories. The Luthy book I cited is rich with detail if you like these historical accounts. Leon, I’m sorry for this, but I did laugh at the spelling mistake in your post. I’m sure you meant “any brother” instead of “any bother.” 🙂 I make mistakes, too, but that one caught my attention. Yes that was good Info. We have many moved here in Columbiana Ohio from NY State. I’m not a real history buff either… maybe because it takes more focus…but I really enjoyed reading about these places. When you’re reading about something you have an interest in you’re able to absorb it. Thanks for the info…very interesting! Very interesting article. It also surprises me about a few of the places Amish continue to live — like Beeville, Texas, and Pinecraft, Florida. New Orleans? Wow, talk about unlikely! Having spent a few years in New Orleans, honestly, I have real trouble picturing Amish living there. Although I do recall seeing some plain folk at the zoo there. I loved the city dearly, in spite of the insane climate — it was the relaxed attitude of everyone that I found so appealing, since you could live in the way that was most comfortable for you. Which perhaps eased things for the Amish in their few years there. People in New Orleans just don’t seem too concerned about changing others’ way of life, and I suspect that’s been true for many, many years. I couldn’t decide if Paraguay or New Orleans was a more surprising location myself. 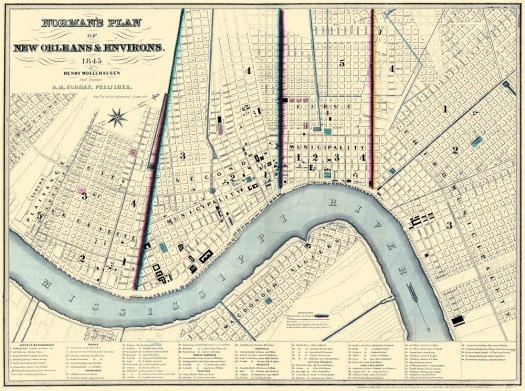 Of course the mid-1800s New Orleans was a lot smaller than today’s version, but it was still over 100,000 people in 1850, making it the 5th-largest city in the country at the time. I find these articles very interesting. I have been researching my family history for about 14 years now, the internet has made it easier but still run into dead ends. In my research I found out my family were from a small town in Michigan that I never heard of. California Corner, California Township, Michigan. So in my research travels I GPS the town and it took me there. I was in shock because the women and children were in Amish clothing and wore white caps and I saw a man in overhauls and blue shirt hauling hay with his horse and wagon. I remembered my grandparents farming and with simple machinery but I never put the two together and realized that there parent/grand parent might have been Amish. Some of the customs have or still enforced even today though we do not live Amish. I admit I do not know much about Amish ways but These articles like this one helps. Thank you for posting. Gladly Debra, neat that you could track your history a little. I checked and there is a 6-district Amish settlement in California Township, founded back in 1960. I visited Branch County once a few years ago. In the county you’ll find all or parts of 5 Amish settlements (as of 2013). Thank you Erik, For the reference and I most defiantly will look it up. Do you Know if The Amish Church’s keep records of their members through out the history of the churches. Debra: I don’t know which is “definitely” better, “you may defiantly look it up” or my “any bother” to being “any brother”, above! Erik, what we may need is a way to go back and edit this posts after they are posted? Or not, the chuckles are friendly! Peter Nafziger, known as Peter the Apostle, was my great-great-great grandfather. I had assumed he was Mennonite, but maybe there were closer Amish ties than I thought between the groups. 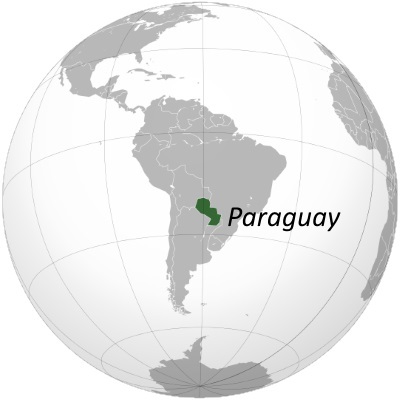 I was a teenager in the late 1960s when I remember some Amish talking about Paraguay, and a young adult when I heard Paraguay was not very promising any more. I don’t think any from northern Indiana went there. I came to this late (have some time off, and I tend not to check my email on days off). Pretty interesting, especially that Amish lived in the New Orleans area (just as I wouldn’t expect them to live in Las Vegas, today). Interesting, about the “history” comments. Like it or not, everyone living today (and anyone ever alive) has helped to contribute to history. It’s just that most of us don’t end up making the headlines (OR the history books). I believe this was a book that I have on my Kindle. I’ll have to look it up and read it again. I enjoy reading things about the Amish.